This is a quick and easy recipe that delivers major flavor. Easily one of my favorite recipes. Definitley worth the trip to fish market ! Heat olive oil to medium heat in a large frying pan. Saute garlic and red pepper flakes and stir constantly for one minute.Lifting pan off heat and swirling until garlic cooks but does not brown. Drain canned clams – reserve liquid in a seperate cup. Add liquid from clams to garlic mixture. Reduce until 1/2 liquid has evaporated. Add wine and clam juice. Add canned clams and fresh clams and stir. Cover and cook until clams open. Drain-Reserve some pasta water and set aside. Return drained pasta to pot. Add a knob of butter and clam sauce and toss. If a little dry-add a little reserved pasta water to loosen it up. *If you are dining with any foodies you may want to skip this step but feel free to sprinkle with grated parmesan when they aren’t looking . Goes great with Spaghetti and Clams! 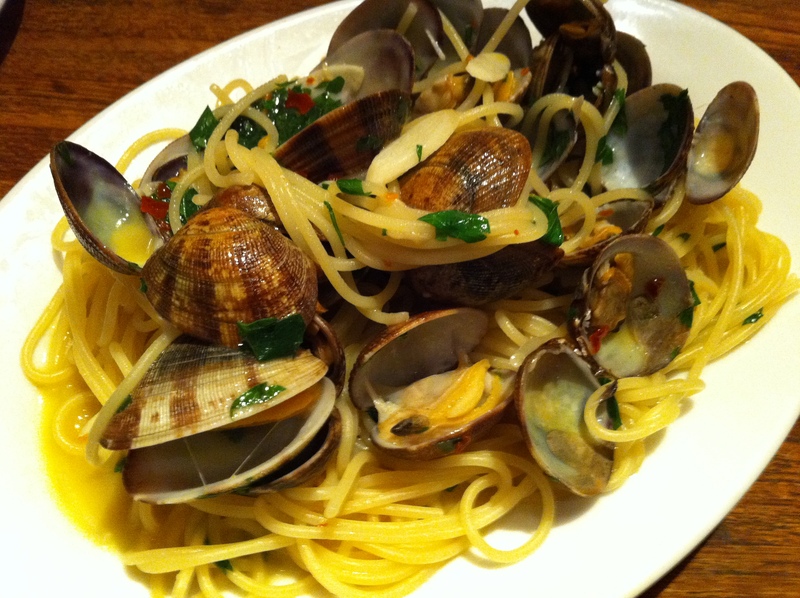 This entry was posted on Tuesday, September 16th, 2014 at 4:30 pm	and tagged with clams, delicious pasta and clams, delicious recipe for spaghetti and clams, easy pasta dinner, pasta, pasta and clams, pasta and clams dinner, simple dinner pasta, spaghetti and clams and posted in Category. You can follow any responses to this entry through the RSS 2.0 feed. « Banana Cake with Chocolate Ganache Happy Birthday Eaton Square Edibles. Four Delicious Years!